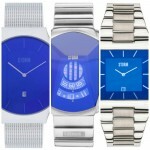 Hi everyone, today we’re taking a look at some of the best mens black watches currently available. There’s a huge selection of 23 stunning black watches on show. I’ve managed to include a good mixture of affordable and high end watches so I’m hoping there is something here to suit everyone. If you have any questions about any of these black watches for men just comment below and I’ll try and help you out as soon as possible. I quite enjoyed putting this list together and it ended up being larger than I had originally intended due to there just being so many nice black watches for men that I felt should be included. 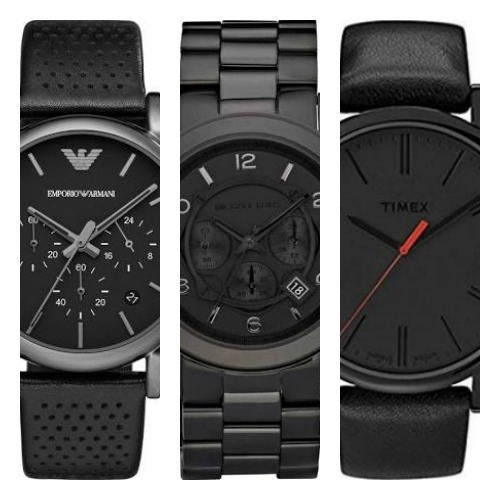 As always, I hope you enjoy this list of the best black watches for men. Let me know what you thought in the comments section below. 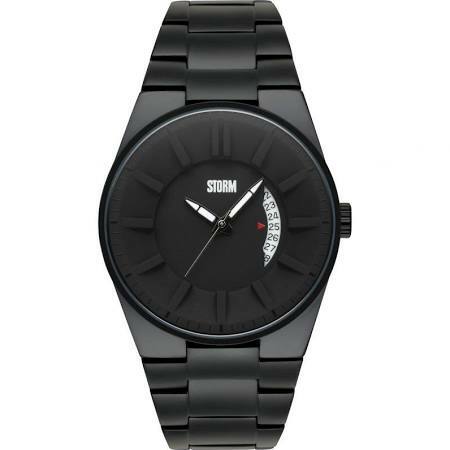 The first timepiece to features in this list of the best mens all black watches is this blackout edition from Storm. This is a stylish timepiece with a 43mm casing diameter and a thickness of 11mm. It’s powered by a reliable and accurate Japanese quartz movement and fastens with a push button deployment clasp. Both the casing and the strap have a black Ion plated finish. This Storm black watch has a 50m water resistance rating which I think is adequate for this style of timepiece. 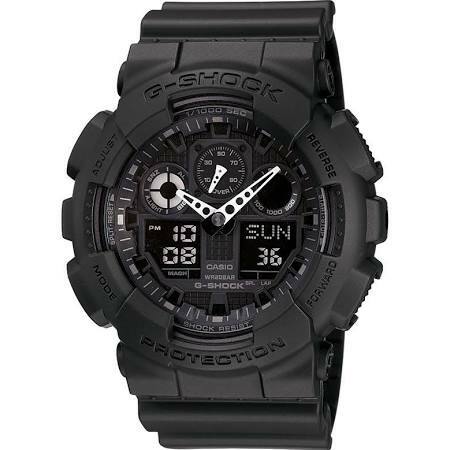 This next mens black watch is part of Casio’s popular G-Shock collection. G-Shock watches are built to be extra tough and durable. These thick resin that surrounds the watch gives it this shock and vibration resistance. This is an extra large men’s all black watch with a 55mm casing diameter and 17mm thickness, that’s pretty chunky. As you’d expect from a dual display G-Shock watch, this model has an array of useful functions that include a chronograph, 5 daily alarms, countdown timer, world time display, perptual calendar, date function, LED backlight, and more. This Casio black watch is powered by a Japanese quartz movement and has an impressive 200m water resistance rating. 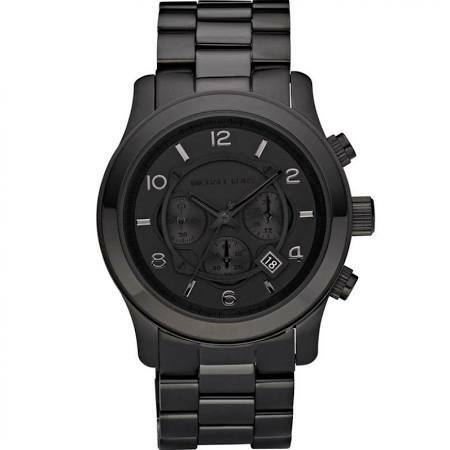 When it comes to mens black metal watches Armani Exchange have quite a few to offer. This is a stylish stealth black Ion plated steel watch with a sleek black dial design that includes black baton hour style markers. It’s a larger mens black watch with a 47mm casing diameter and 12mm thickness. 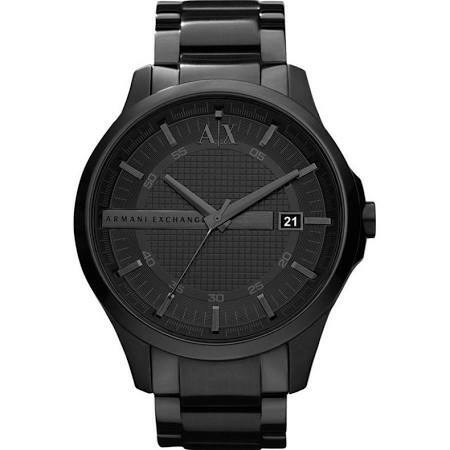 Powering this Armani Exchange watch is a Japanese quartz movement that offers reliable and accurate timekeeping. The watch also features a 50m water resistance rating. 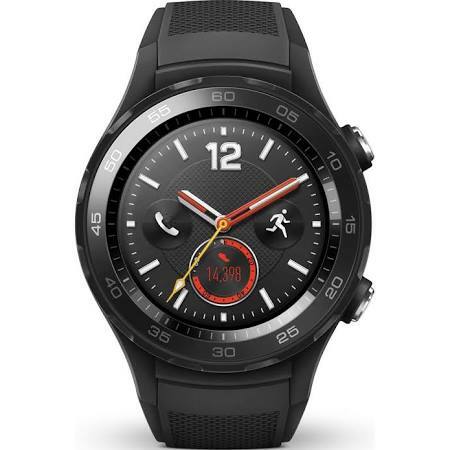 Here we have a popular men’s black smart watch from Huawei. The Huawei watch 2 sport 4G with Android Wear 2.0 has a brilliant selection of smart watch features. The watch supports a sim card so you can get calls and messages but note that one isn’t included. Extra features and functions include a buuilt in GPs, heart rate monitor, real time coaching, smart notifications offline music and a ceramic bezel. This men’s all black smart watch is compatible with both Android and iOS. Strictly speaking this is more of a dark grey watch than an all black watch but the design is still going to make it into today’s list. As far as a men’s black watch I’d class it as pretty close. 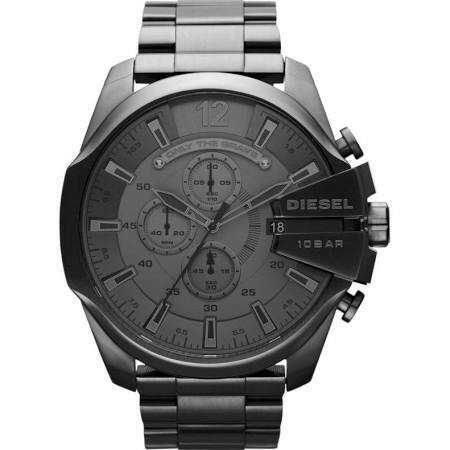 this Diesel timepiece is part of the Mega Chief collection. It’s a large watch with a 51mm casing diameter and 12mm thickness. The dial features black baton hour markers and high visibility hands with a date function at the 3 o’clock positions. 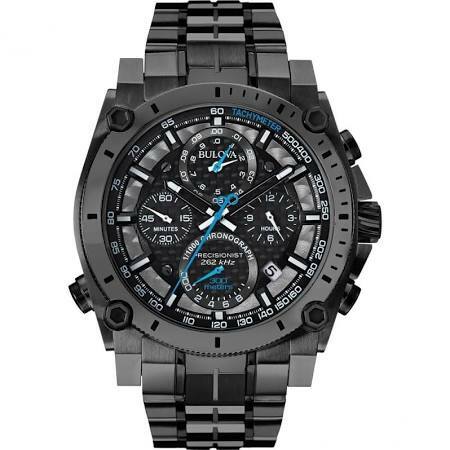 This black mens watch is powered by a Japanese chronograph quartz movement and has a 100m water resistance rating. 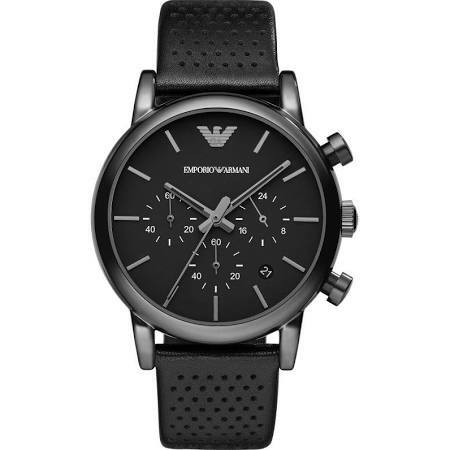 Up next we have another popular mens all black watch from Emporio Armani. This is a stunning all black design watch that’s powered by a reliable and accurate Japanese quartz movement. The casing is made of a black ion-plated steel and is paired up nicely with a genuine black leather strap. As well as a chronograph display there’s also a small date display on the dial between the 4 and 5 o’clock hour markers. 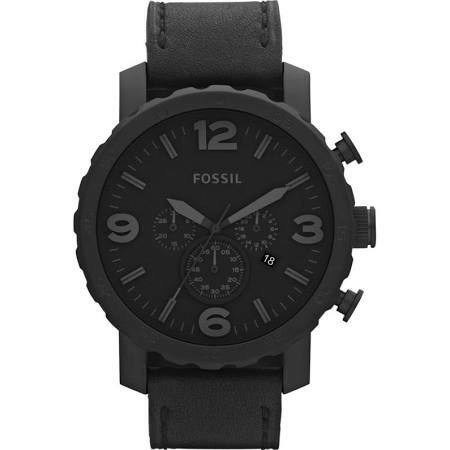 Next up in our list of the best mens black watches is this popular Nate chronograph from Fossil. This is an oversized watch with a large 50mm casing diameter and 14mm thickness. The Nate watch has a black-ion plated steel casing and a genuine leather strap in black also. The wtahc is powered by a Japanese made chronograph movement and has a 50m water resistance rating. 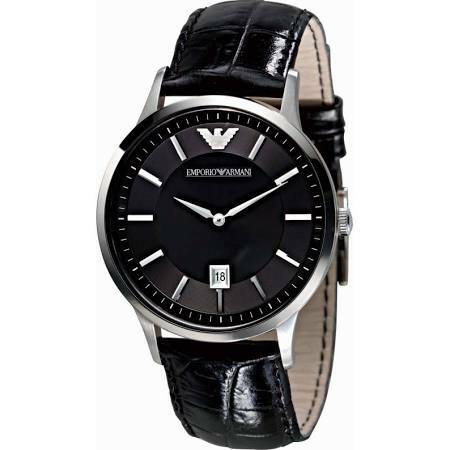 Here we have another popular mens black watch from Emporio Armani. This is sleek designer timepiece with a black dial and black genuine leather strap. The dial features silver hour markers and slim silver hands with a date display at the 6 o’clock position. This gents black watch is powered by a Japanese quartz movement and has a 50m water resistance rating. 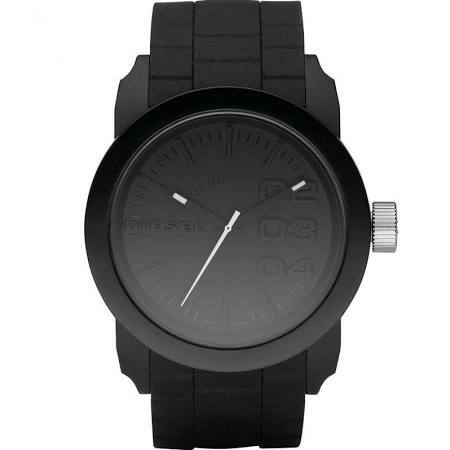 Here we have another popular slick mens Diesel all black watch. We featured the reverse all white model in our previous article yesterday so it’s fitting to include this timepiece in today’s list. The design in all black is made from a combination of resin, plastic and stainless steel. The dial uses a combination of numerals and baton hour markers with the tips of hands in white to make them stand out. This Diesel black watch is powered by a Japanese quartz movement and has a 50m water resistance rating. 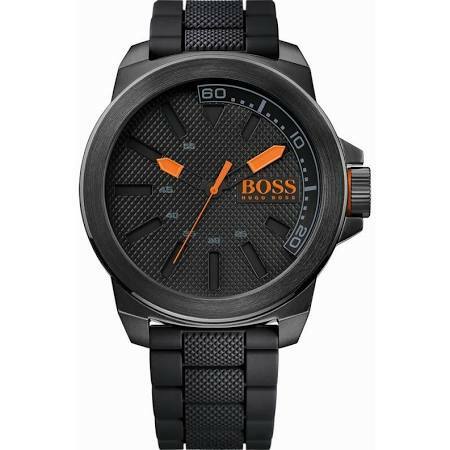 This is a take on mens black watches by Hugo Boss Orange. This is an oversized bold black watch with an ion plated steel casing and black rubber strap. The casing of this black watch measures 50mm in diameter with a thickness of 13mm. It’s powered by a reliable Japanese quartz movement ad features a basic 30m water resistance rating. Next up in our list of the most popular black watches for men is this oversized Gucci timepiece. 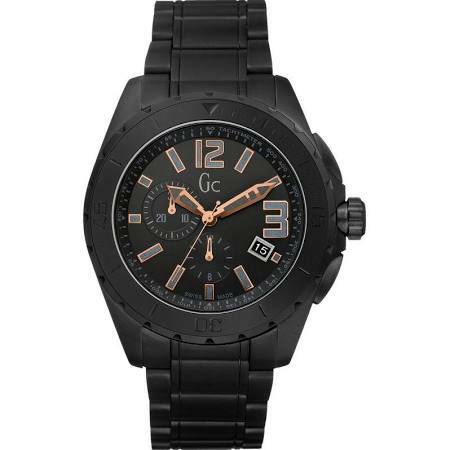 The Gucci XXL Blackout is a black ceramic watch with ultra stylish high visibility hands and hour markers. The casing and strap are both made of Ceramic which is a popular lightweight material for watches. Powering this mens black watch is a Swiss quartz movement for excellent timekeeping. This timepiece also has an impressive 100m water resistance rating. 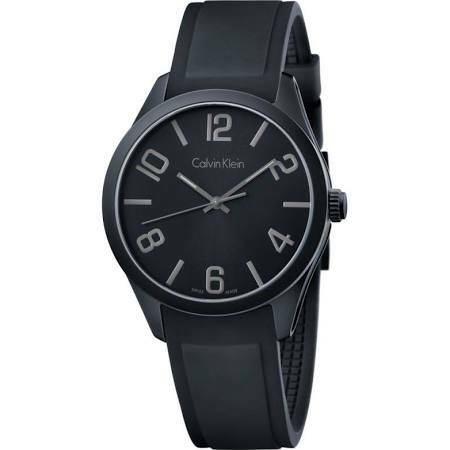 Calvin Klein have produced this popular all black mens watch that features an aluminium case that gives the watch a lightweight design. The strap is made of a black rubber and fastens iwth a buckle style clasp. Powering the watch is a Swiss quartz movent which is excellent to see. As far as water resistance goes it has a simple 30m rating. This is a stunning timepiece that’s based off of Bulova’s moon watch that made history on August 2, 1971 during the Apollo 15 moission. If you get a chance I recommened reading my full Bulova Moon Watch 96B251 review. This is an ultra accurate precisionist timepiece that has a frequency of 262 kHz. The hands of this mens black watch feature super luminous coating and the glass is made of an anti reflective sapphire crystal. I could go on talking about this stunning watch for ages so I recommened reading the review for all the info on it. 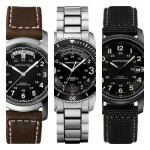 Michael Kors have a great selection of mens black metal watches available. This is the Runway which is a chronograph watch that’s made with a black ion plated steel casing and strap. It’s an all black mens watch that’s powered by a Japanese quartz chronograph movement and has a decent 100m water resistance rating. 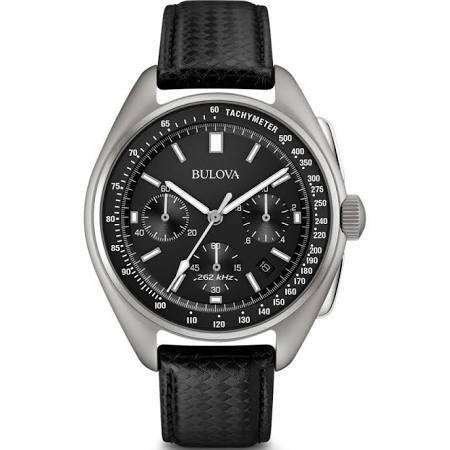 This is another one of my favourite black watches for men from Bulova. It’s another stunning black watch from their precisionist collection. It has a ultra accurate movement that features a 262 Khz vibration frequency, this is eight timers greater than a standard quartz watch. It also features a sapphire crystal glass for excellent scratch resistance and a super impressive 300m water resistance rating. 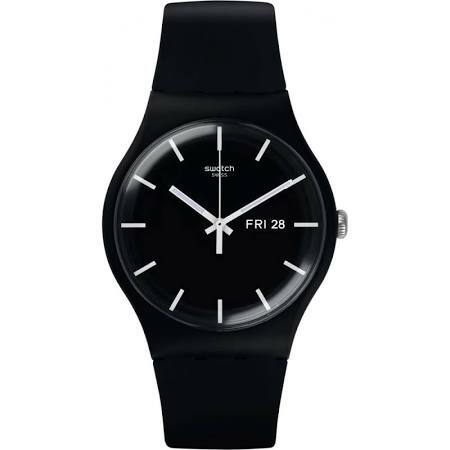 Here we have a unisex black watch from Swatch. This is an affordable black watch with silver hands and hour markers for a high visibility dial. The Swatch timepiece is made of a plastic resin and is fitted with a black coloured strap. Powering the watch is a Swiss quartz movement which is rare to see in an affordable timepiece like this. If you’re looking for something higher end then this Swiss black watch for men might just be the ticket. The tissot T-race is a mid to high end luxury watch that’s Swiss made and features a quality Swiss quartz movement for excellent timekeeping. The casing is made from a black Ion plated steel which is paired up nicely with a black rubber strap. 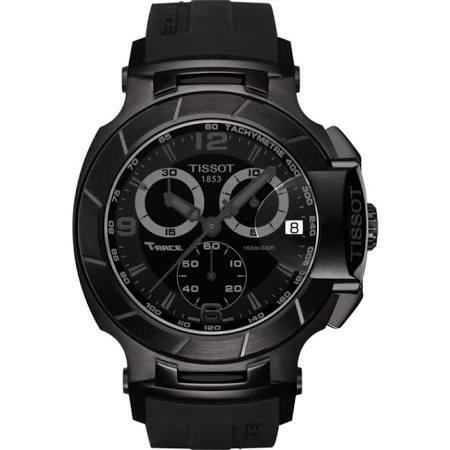 This black chronograph watch from Tissot also features an impressive 100m water resistance rating. 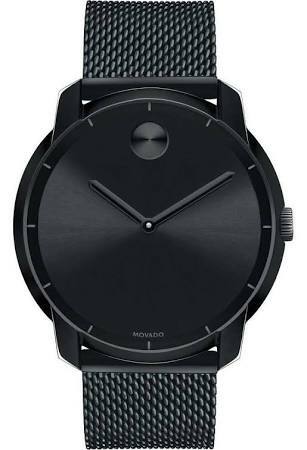 Next up in our list of the best mens all black watches is this iconic timepiece from Movado. The brand that’s best known for its iconic museum watch features the same iconic dot design for this all black watch. This Movado timepiece features a comfortable black mesh strap that’s easy to adjust too. Powering the watch is a Swiss made quartz movement for excellent reliability and timekeeping. 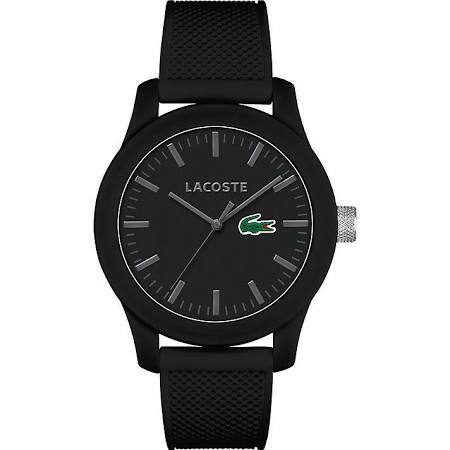 Here we have an affordable all black watch for men from the popular brand Lacoste. The 12.12 series features a range of single colour watches with the white edition features in our list of the best white watches for men. this Lacoste mens black watch is powered by a Japanese quartz movement and has a basic 30m water resistance rating. 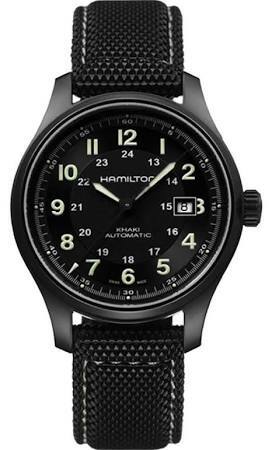 This is a higher end timepiece from Hamilton to features next in our list al mens black watches. Hamilton create some absolutely fantastic watches and they’re one of my favourite Swiss watch brands. This black automatic watch is made with a black ion plated titanium casing that makes it lighter and stronger than stainless steel. It’s paired up with a black fabric strap that fastens with a buckle style clasp. Powering the watch is a Swiss automatic movement that’s often desired in a high end watch. 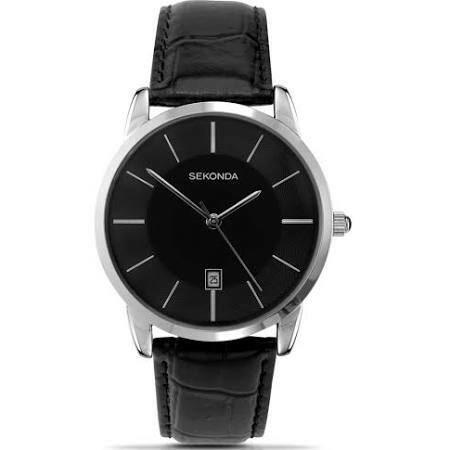 When it comes to affordable black watches for men Sekonda have a nice selection available. This sleek affordable watch is made with a round stainless steel casing that measures 38mm in diameter with a thickness of 9mm. It features a round black dial with slim silver baton hour markers and a small date function at the 6 o’clock position. If you’re looking for a cheap black watch then this is worth considering. 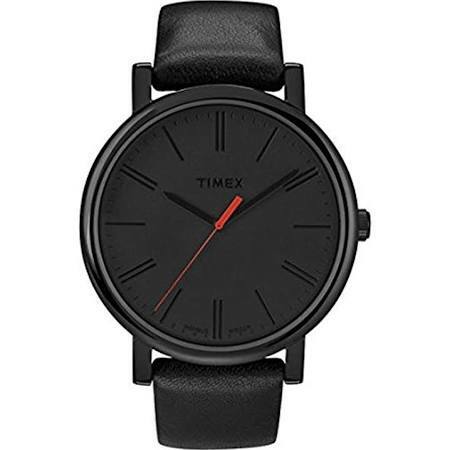 This is a popular cheap mens black watch from Timex that I think offers really good value for money. It’s a super affordable black watch from the Timex Easy Reader collection. It features the Timex Indiglo technology that lights up the dial for excellent visibility in dim lit conditions. This mens all black watch is powered by a reliable and accurate quartz movement and has a 30m water resistance rating. 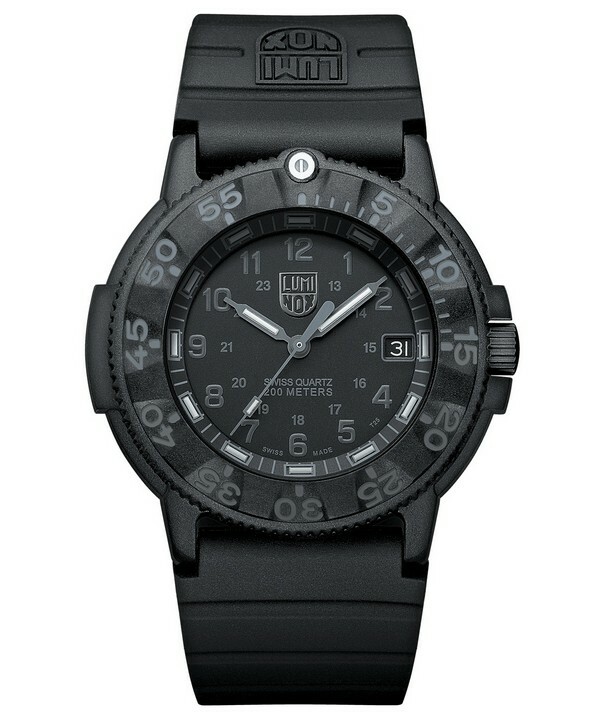 The last timepiece to feature in our list of the best mens black watches is this ultra stylish model from Luminox. The Luminox brand works closely with military groups all over the world designing custom watches to meet the needs of special forces like the air Force and Navy SEALS. These all black mens watches are actually incredibly easy to read in dim lit conditions due to their excellent LLT gas lit luminous hands and hour markers which provide constant night visibility for up to 25 years. These are built as durable extra strong watches, the casing is made with a plastic/resin carbon reinforced polycarbonate structure that’s paired up with a thick rubber strap. The watch is powered by a very reliable Swiss quartz movement. The glass is made of a mineral crystal that’s much less likely to shatter under extreme stress than standard sapphire crystal. Thanks for taking the time to read through my list of the best black watches for men. Hopefully with any luck you’ve managed to get a little inspiration as to what type of all black watch would suit you best. I’d love to hear what your favourite watch was from today’s list so comment below and let me know.